$3.49 to $399.99 & FREE Shipping on orders over $59 $35. 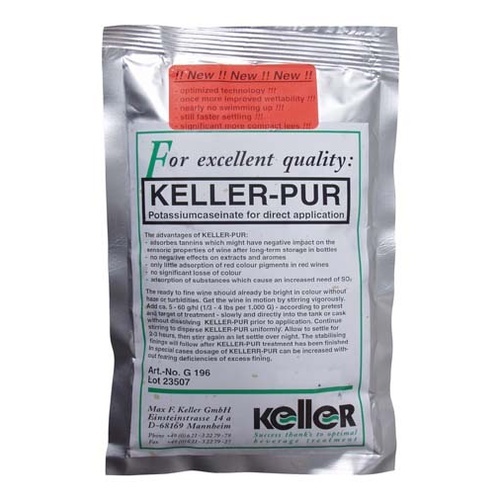 Keller-Pur Potassium Caseinate preparation offers the best in tannin management addition technology to the winemaker. The caseinate will adsorb negatively impacting polyphenols and vinegar precursors. Its also effective against substances which can bind out SO2, thereby requiring higher concentrations and more frequent additions of sulfur. While this fining will tend to soften the wine and reduce astringency due to its removal of insoluble tannins, it does not negatively impact the wine's color, aroma or flavor concentrations - and carries no risk of excessive fining because it only removes unstable, insoluble tannins. The product is best characterized by its very fast and very compact lees formation, allowing for shorter effective treatment times and a minimization of product loss due to adsorption into the lees. Bench trials are recommended to determine the lowest effective concentration to further minimize product loss. Direct addition formula requires no special preparation, simply stir the wine vigorously and sprinkle in slowly, continuing stirring until all the additive is dissolved. Rack off in 2-4 days. Bench trials are highly recommended to determine the lowest effective concentration in order to maintain the highest possible product yield. Apply at a rate of 0.05-0.6g/L (0.2-2.4g/gal). I use it for clearing fruit wines with great results. It creates compact lees and goes not strip away the delicate fruit aroma or the fruit forward taste I am looking to keep. It is very simple to use also. My only complaint is the cost! !